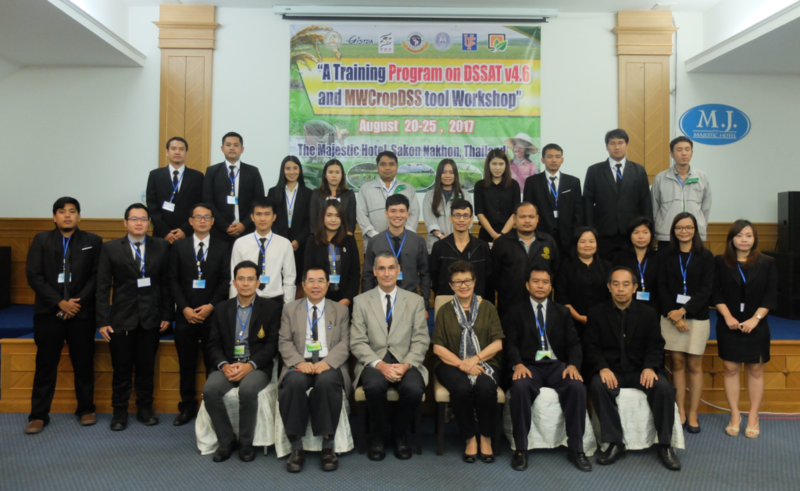 The DSSAT 2017 & MWCropDSS International Training Program, was successfully held at the Majestic hotel, Sakon Nakhon, Thailand from August 20-25, 2017. Twelve 12 newly recruited researchers from the Rice Department, four staff from Geo-Informatics and Space Technology Development Agency (Public Organization) (GISTDA), and six staff from the Office of Agricultural Economics (OAE) attended the 6-day workshop to learn more and gain better understanding about the science and application of crop simulation models and decision support systems using DSSAT as the main tool. A new version of DSSAT v4.7 and MWCropDSS v3.0 were used in the training program. Thank you for financial supports from The Thailand Research Fund (TRF), Rice Department and Geo-Informatics and Space Technology Development Agency (GISTDA) (GISTDA). Thanks are also due to all trainers and participants for a successful workshop.